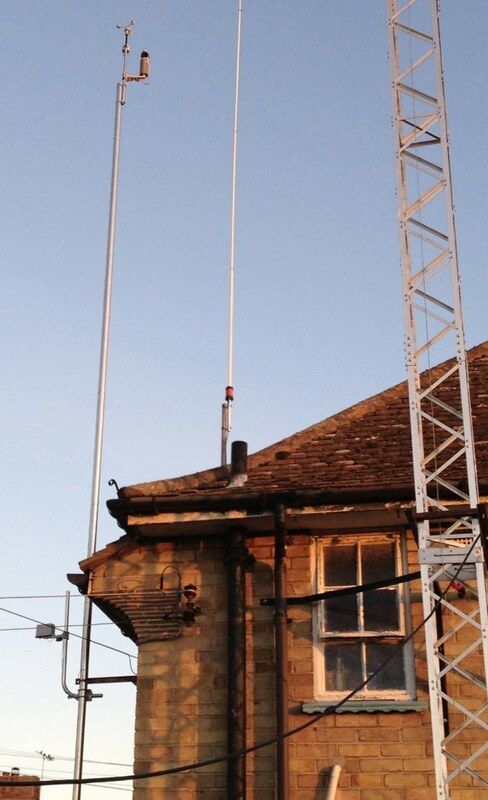 Last weekend when we did the work on the mast, we also put up a weather monitoring station here. I don’t have a real interest in the weather but I’m keen to know what the wind is doing and I’ve been looking at weather stations for some time. I’ve worked out that the stations within my budget are a compromise and tend to fail after a year or so but I can live with that. I bought a Watson W8681-Solar which is a rebadged WH3081 made by Fine Offset and last weekend it was installed at the top of a 20ft pole, mounted 8ft off the ground. Over the course of the week I’ve discovered a number of limitations and so today I took it all down, made some tweaks and raised it back up again. Here it is, you can see the anemometer and temperature/humidity etc sensors at the top of the pole and the rainfall monitor mounted on a pole at the bottom. One of the problems was that the rainfall sensor was giving false readings when the wind blew and the pole wobbled. The angled pole is nicely stable and that should prevent any incorrect readings. I’ve got the weather station console connected to a dedicated computer which is uploading to a website and so you can view my weather here or there’s a Silverlight based realtime version here. Great post. I’ve got a Maplin N96GY, still in its box, which looks to be the same as your W8681. I can use your pictures to show how the station should be installed. I came across your blog while I was looking into ham radio. I thought, if I’m getting the weather station put on a pole I may as well get a radio mast as well, though I’m not yet into ham radio.